It’s a big day around here. 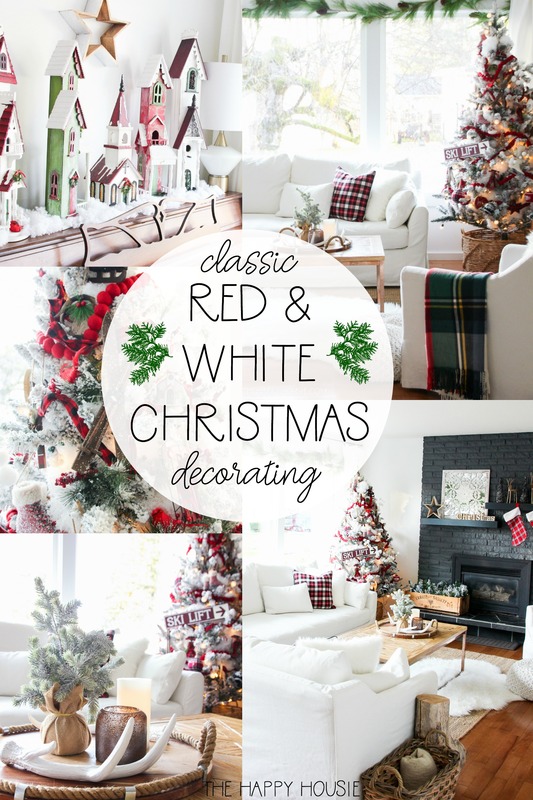 Not only am I thrilled to be sharing my simple and classic red and white Christmas decor for this year, but I’m even more excited to be sharing the first sneak peak at our new home! 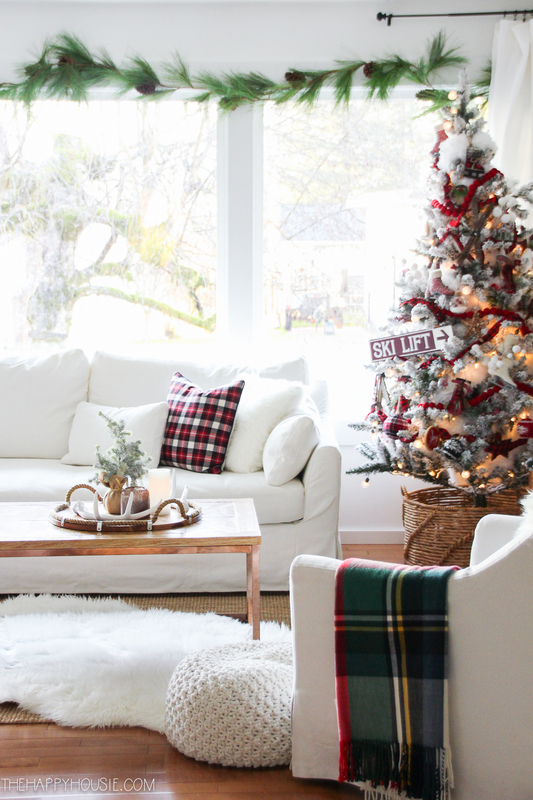 We moved in a little over two weeks ago and I’m so thrilled to be finally starting to settle in and to have it ready for the holiday season. Well, at least in the living room! 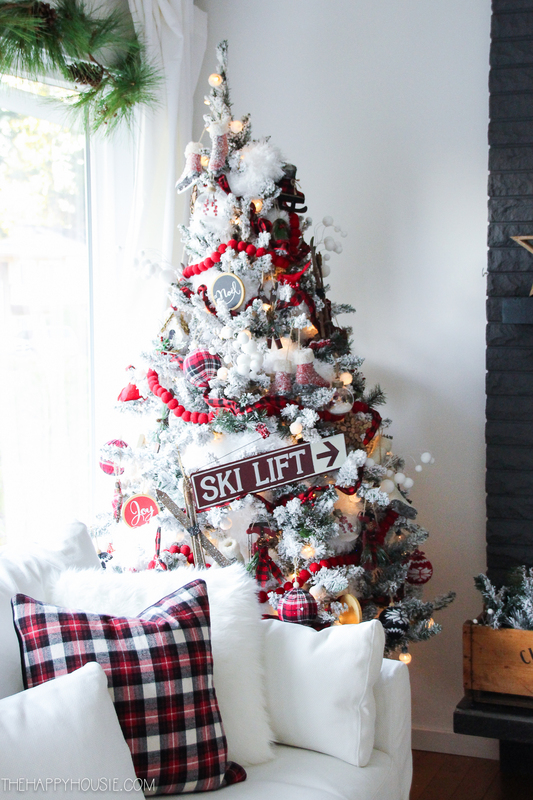 All week long I’ve been hosting the Seasonal Simplicity Christmas series and I’m overwhelmed by the amazing decor and inspiring Christmas decorating ideas that have been shared. 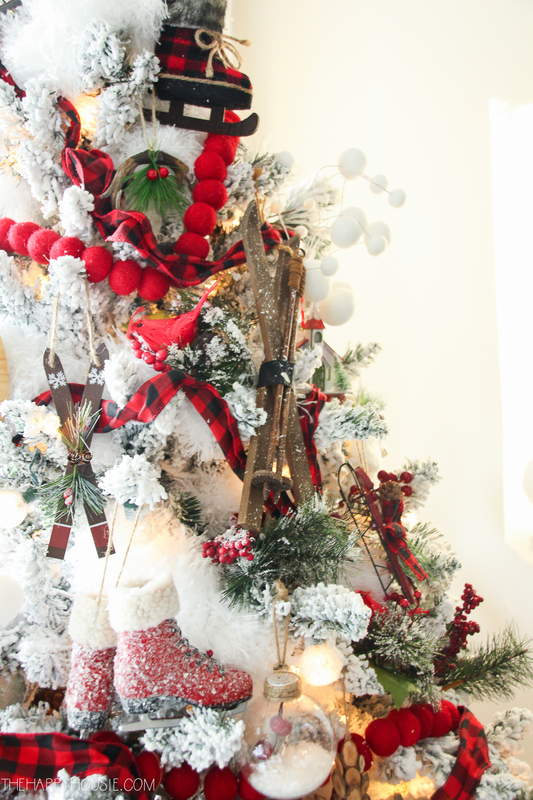 It always amazes how many different ways there are to decorate for a holiday (or in general!) and how they can all be so fabulous yet unique. 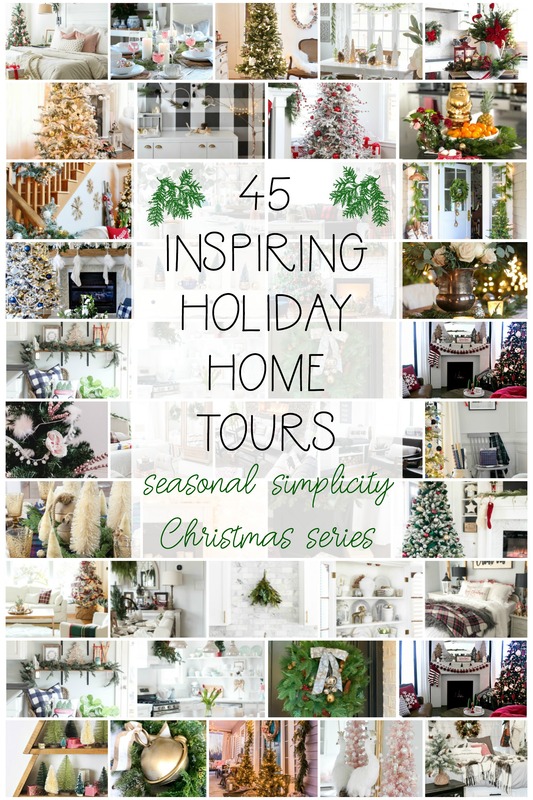 Which is why I love these tours and hops – they are the perfect excuse to go nosing about in other people’s homes! If you’ve hopped over today from All Things With Purpose, then welcome! 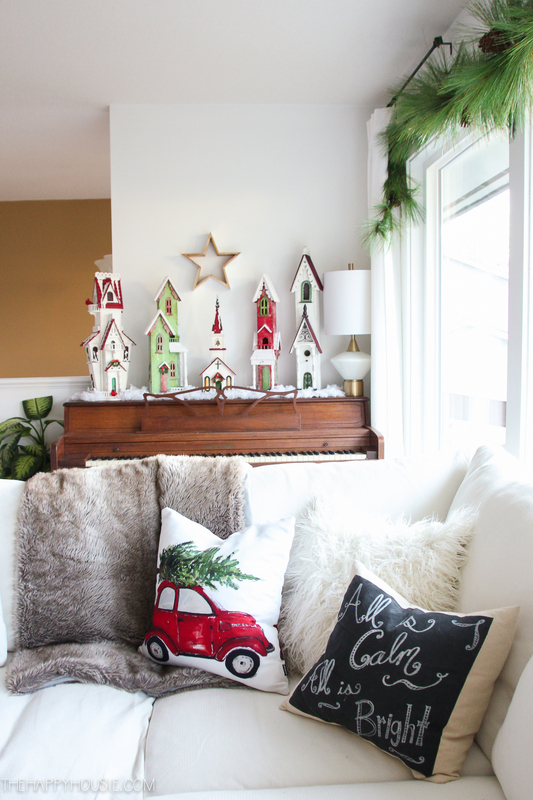 Isn’t Sara’s cozy camper such a fun spot for a Christmas tour? I love it! Don’t forget to check out the rest of today’s (and this week’s) tours at the bottom of today’s post. 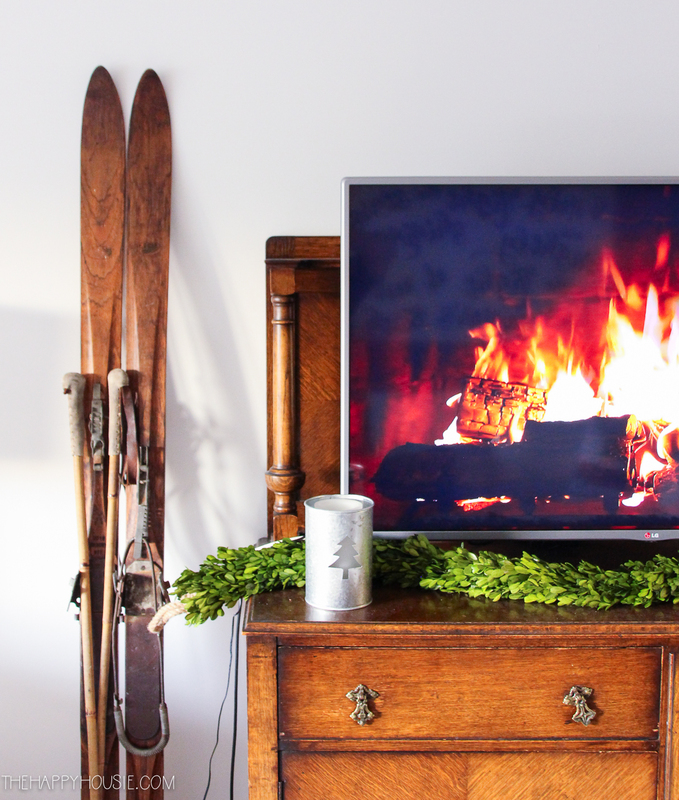 Now… without further ado, welcome to our new living room! 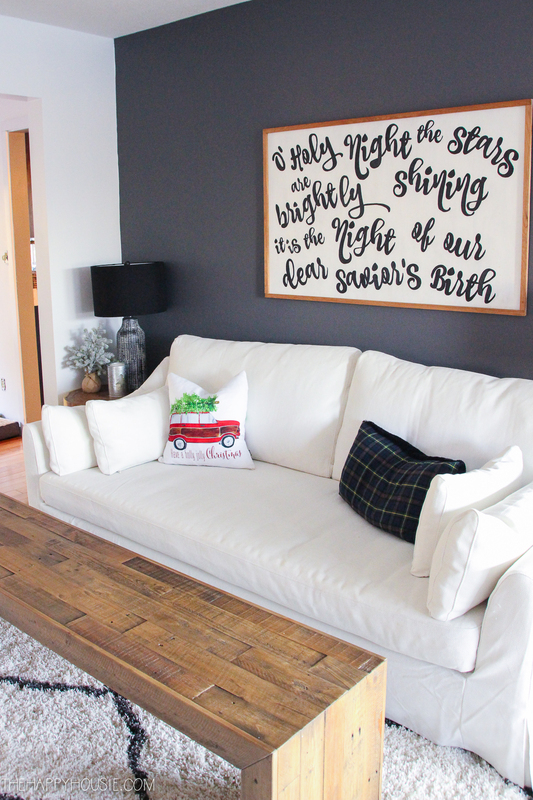 We purchased new sofas and decided to stick with the Ikea Farlov line (the same as the big chairs we have that I reviewed here). 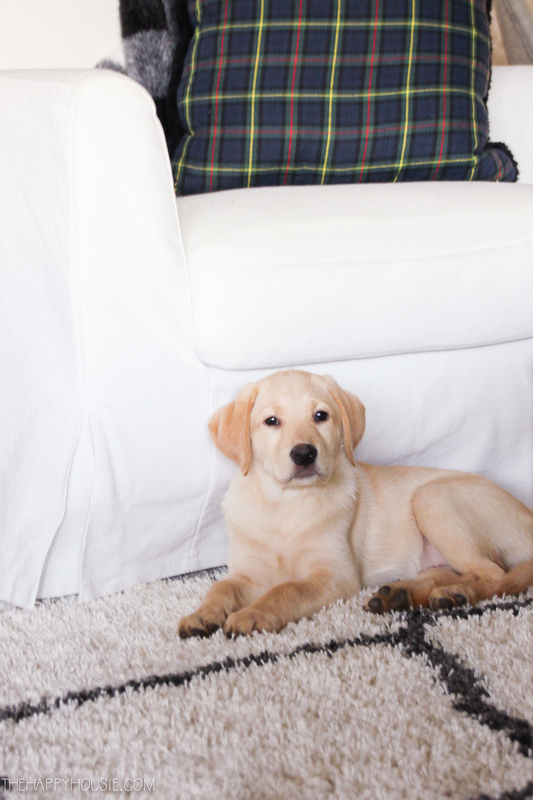 After spending hours looking at light coloured upholstered furniture, I decided that white slipcovers truly are my best bet… especially now that we have a new puppy and I want to be able to wash them if needed. 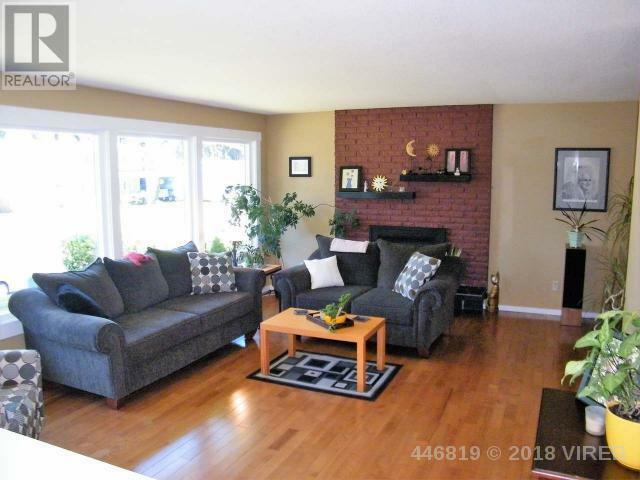 Speaking of the windows, they wall to wall windows in the living room were definitely a huge selling feature for us, as were the greenbelt and pool in the backyard. I’ve got some blinds on order, so until then we are living in a bit of a fishbowl. Good thing it’s a quiet street! And after living in a very rural spot for many years, it’s nice to have neighbours around again. 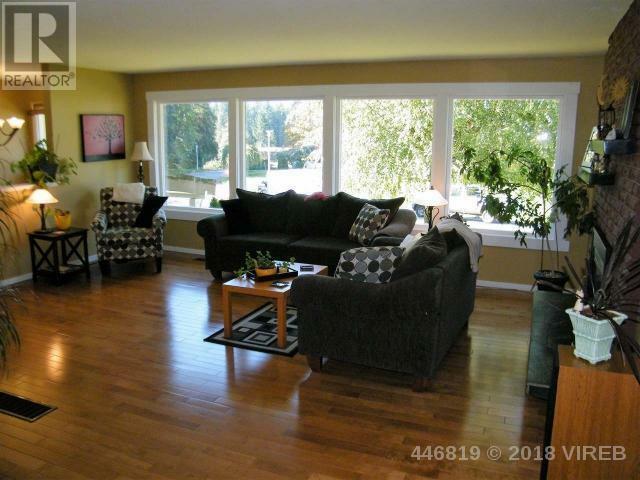 The windows stretch pretty much the full 18′ length of the living room. The piano (that the previous owners left behind for us), sits in the corner closest to the stairwell and door (the house style is a cathedral entry). I’ve got it dressed with my old giant Christmas village for the season. You can see behind it where I haven’t gotten to whiting out the previous golden yellow paint colour in the stairwell yet. I’m actually really excited about the fun wall treatment that I haven planned for that spot! 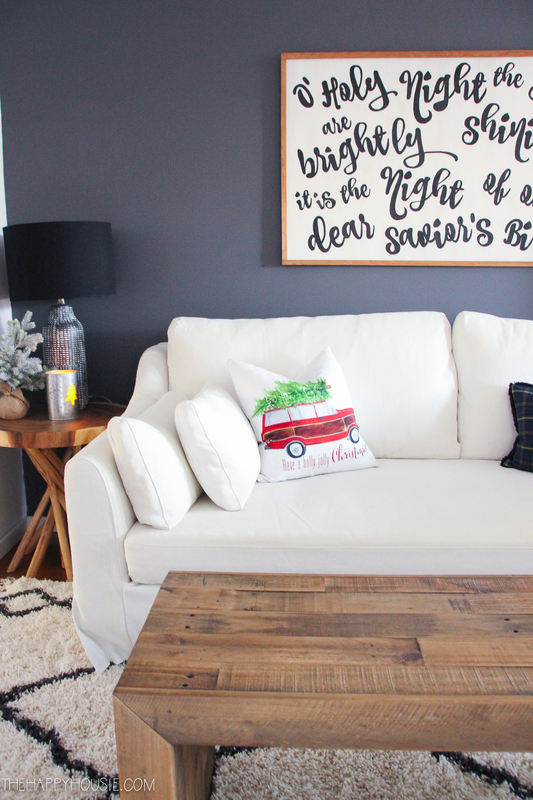 Since we sold most of our furniture to the new owners of our old house, it was a mix of fun and exciting and super stressful to figure out how we wanted to furnish this house. I’m definitely going with an eclectic mix of modern, vintage, and transitional pieces. Despite feeling like the age and era of this house (1968) demands a more modern style in the decor, I just couldn’t give up finds like this old crate, so it will definitely be a bit of a bohemian mix. 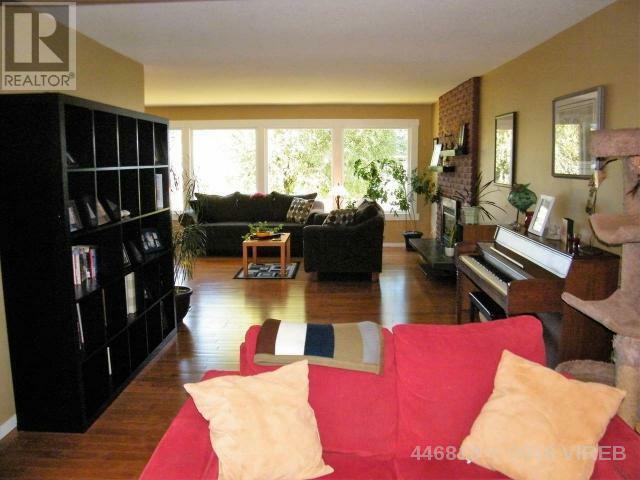 Directly adjoining this living room space is another area that we have now setup as a TV area. Despite all the new furniture, I think my favourite new find just might be this vintage cabinet found on Kijiji. Isn’t she beautiful?!? 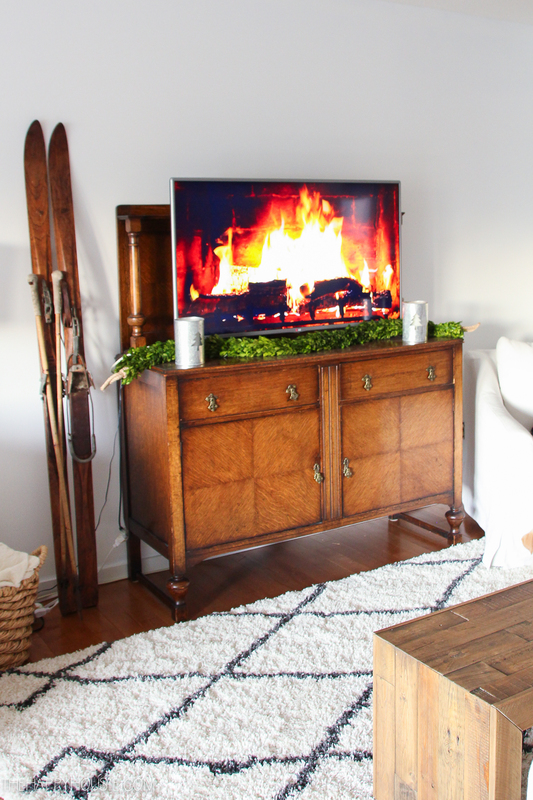 Perfect for our TV! And I have to say that although it might seem a strange layout, I absolutely love having two areas next to each other and a separate area for our TV and sitting area. It works great for our family. 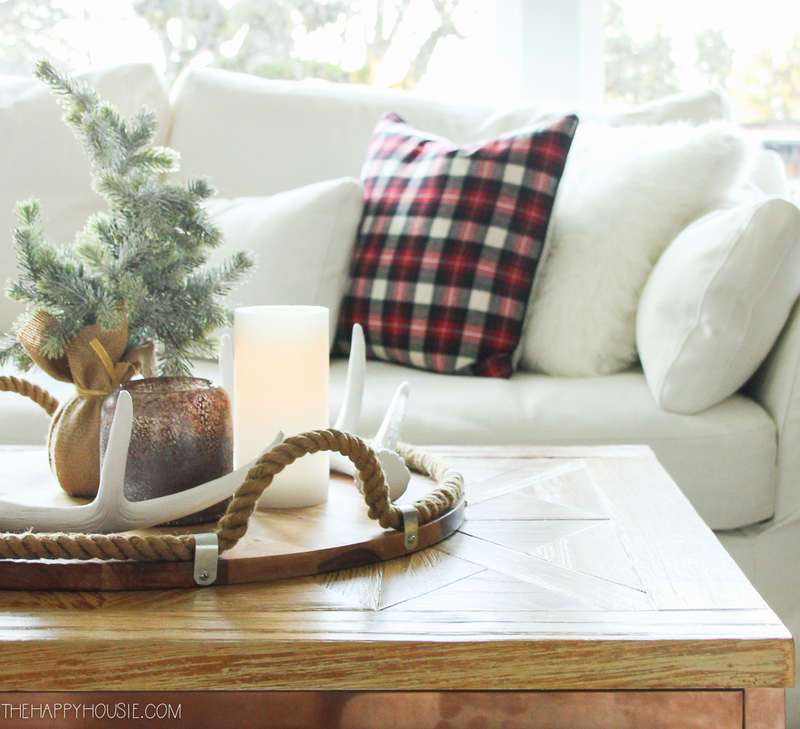 By sticking with whites and neutrals and lots of rich natural wood tones, I think it will be easier to transition between the seasons as I love to do. 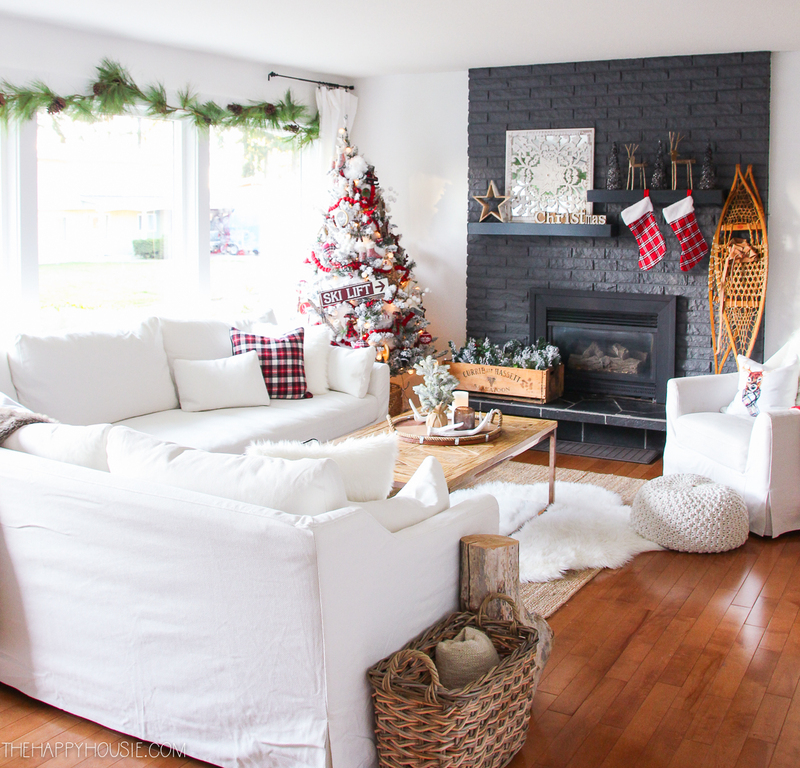 There will be many changes and renovations to come in this house, but seeing the before and afters like this, as I write this post, I feel much more settled already. 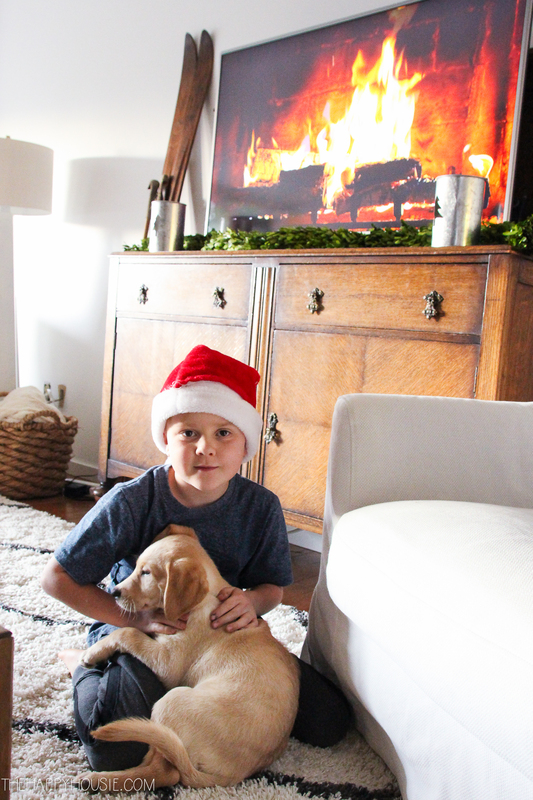 I know we will have a cozy and special Christmas here, with our family including the newest addition to our family. Up next is my friend Shannon at Home Made Lovely. 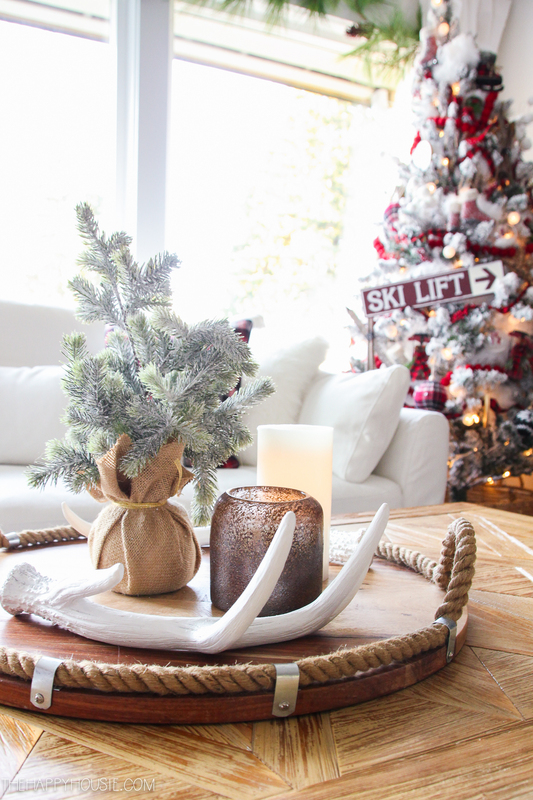 I know you will love her crisp and cozy holiday decorating. And don’t forget to enjoy the rest of the tours that have been happening all week long..
Want to remember this? Then PIN it! Congratulations on your new home. 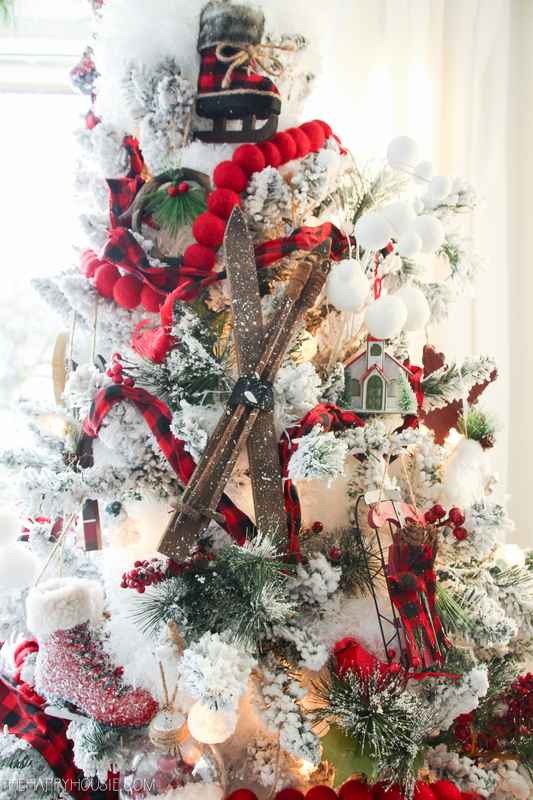 How beautiful your holiday decor looked. Thank you for sharing. Wishing you happy days in 2019. What a dream!!!! I am in love with it all!!! I can’t believe what you have done so quickly! It is amazing what a can of paint can do! You have transformed that space amazingly with little work compared to other projects of the past. Congrats again on the new home! I love your new place so far! Can’t wait to see what you do with it as you settle in more! Congratulations on the new home and new puppy! We did the same thing a few years back – moved, rennovated and adopted a puppy all at the same time. It was crazy but the cup did not spill over, lol! While ill-timed, Lucy was the best thing we have ever done for our family. Dogs are the best! I love the style of your new home so far! 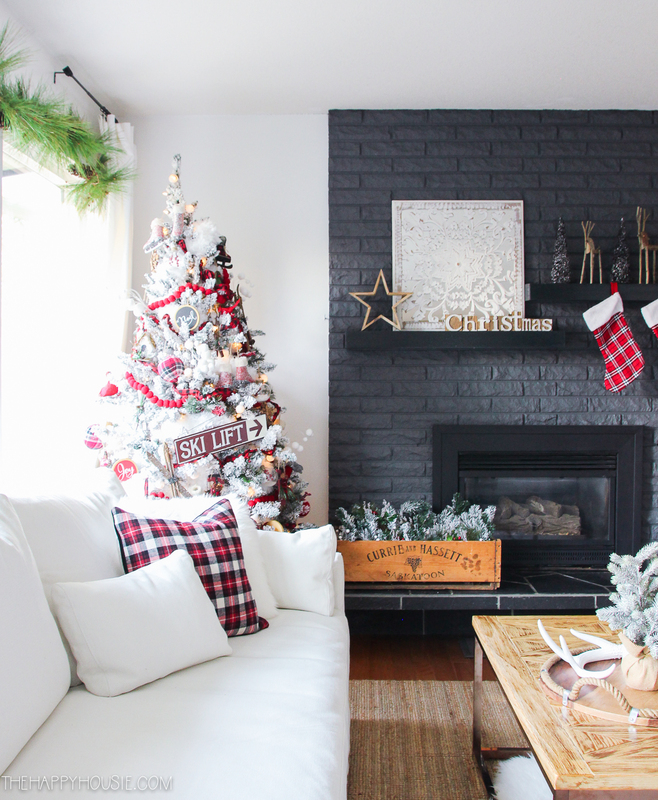 The white walls and dark fireplace are my favorite! 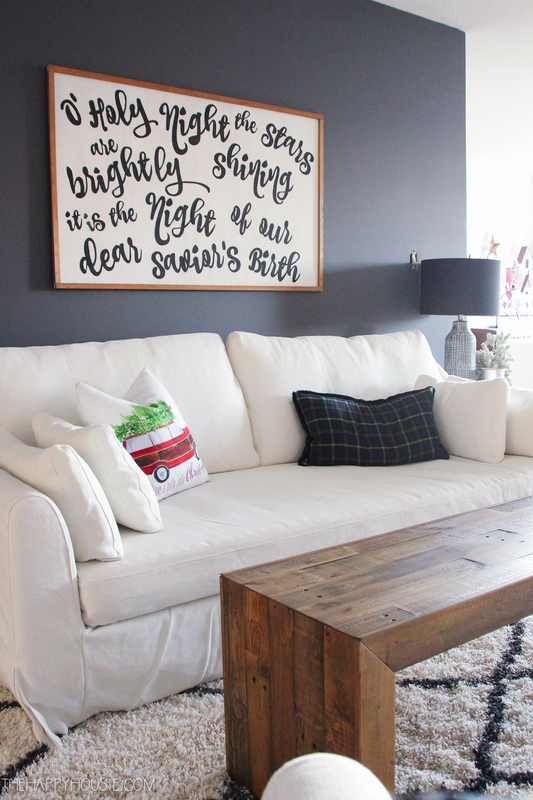 You are certainly brave to go with a light sofa, thank goodness for washable slipcovers and God Bless IKEA! It looks absolutely gorgeous. I’m soo jealous! 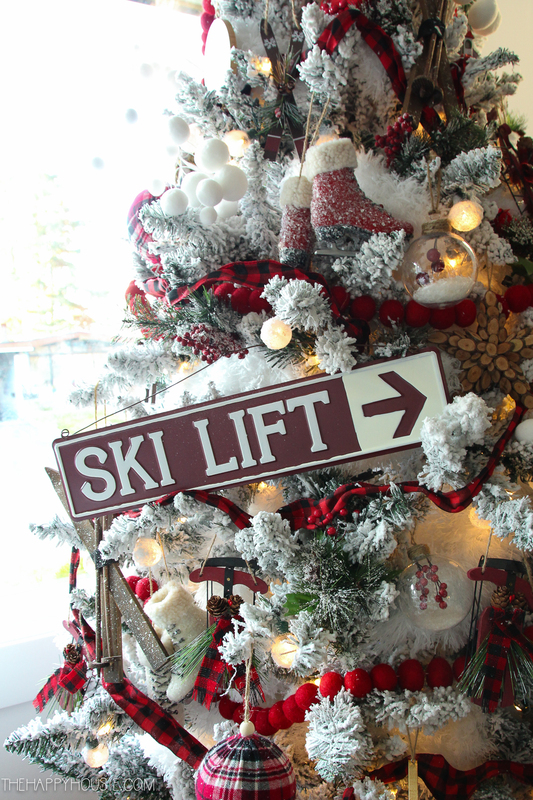 Must ask where did you get your pillows, ski lift sign and song sign? Hobby Lobby? 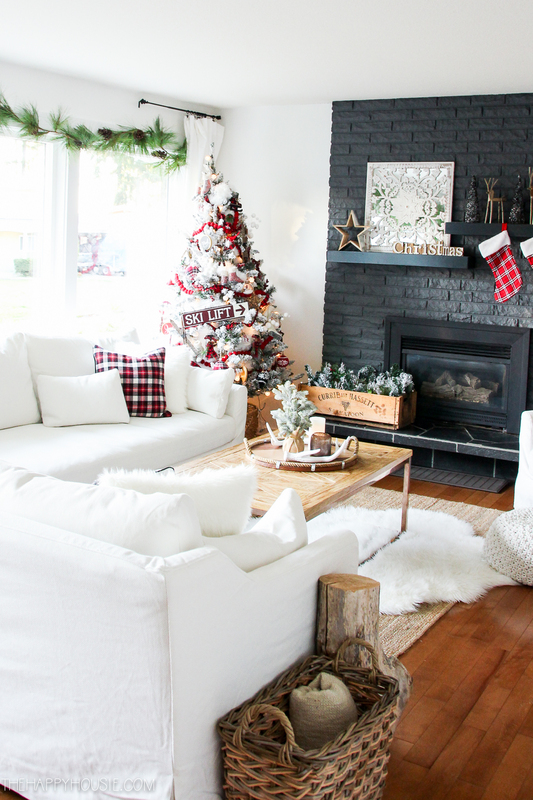 Don’t know if I could live with the white couches for long with twins though. It is gorgeous. Krista that is one beautiful transformation! Amazing what some paint can do (and your wonderful collection of furniture ;)). 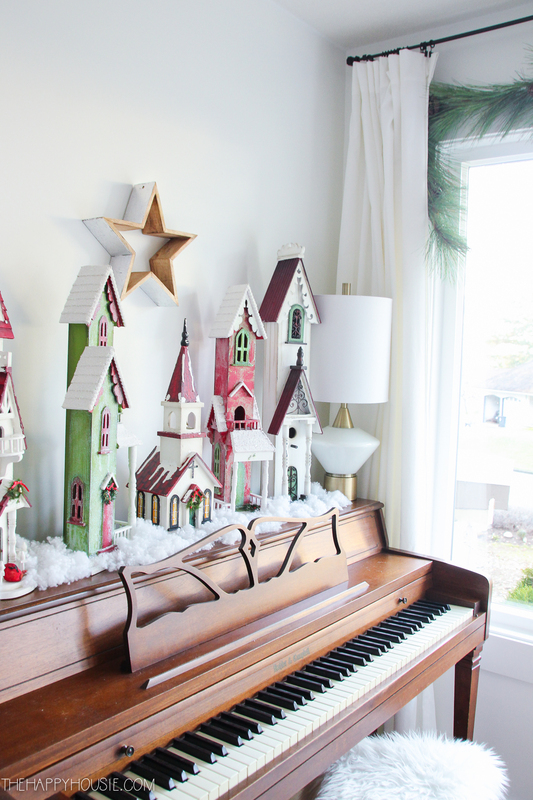 That house collection on the piano just might be my favorite. Hi there! So GORGEOUS:) trying to catch up and must have missed alot! Did you decide not to purchase the plot and build at the lake? Will you still have your lake view in your new home? Straight out of a magazine 🙂 White makes everything beautiful in my opinion!!! Can’t wait to see all the lovely changes you’ll make. And your new pup is gorgeous! Happy Christmas from sunny Australia! It is too beautiful! 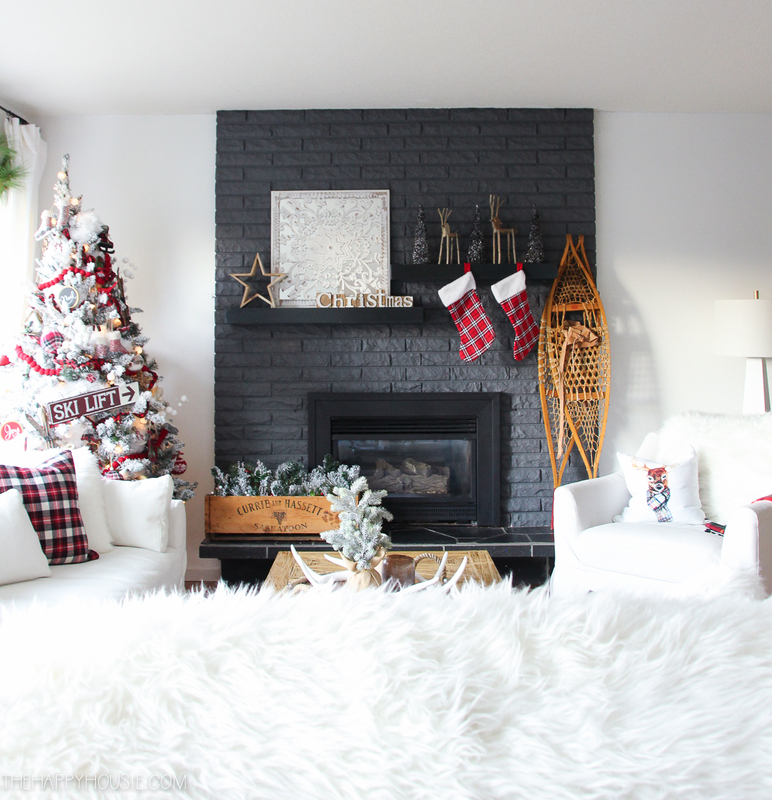 Love what you did with the fireplace. Do you remember where you got your large Christmas village from? Happy Holidays. 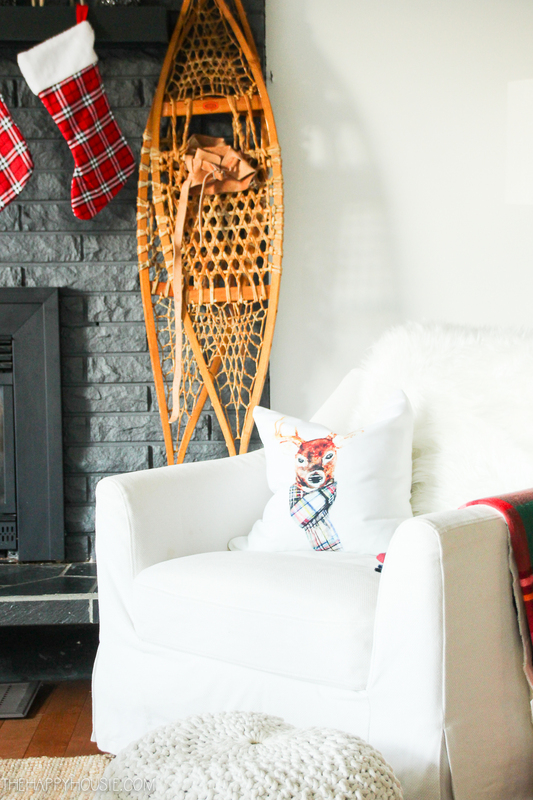 Everything is looking SO cozy already! SO excited to follow along with this journey as you continue to make this house your home! 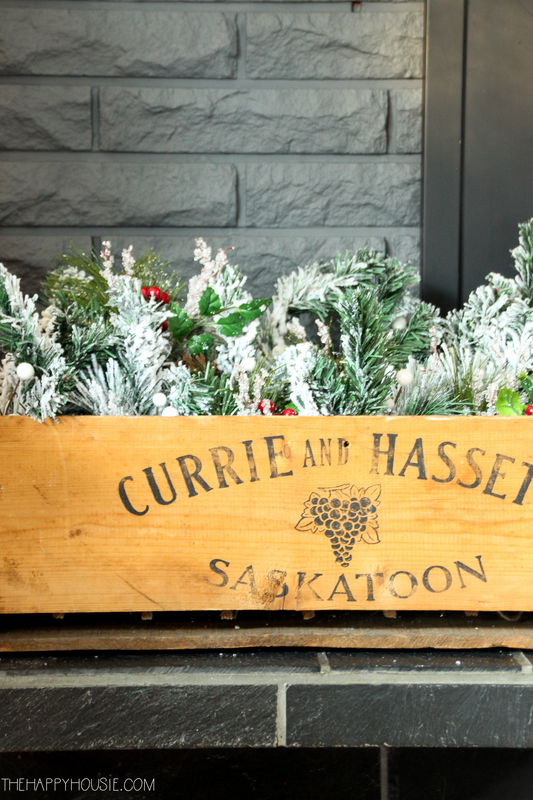 Happy holidays to you and yours my friend! Wow, what a change. 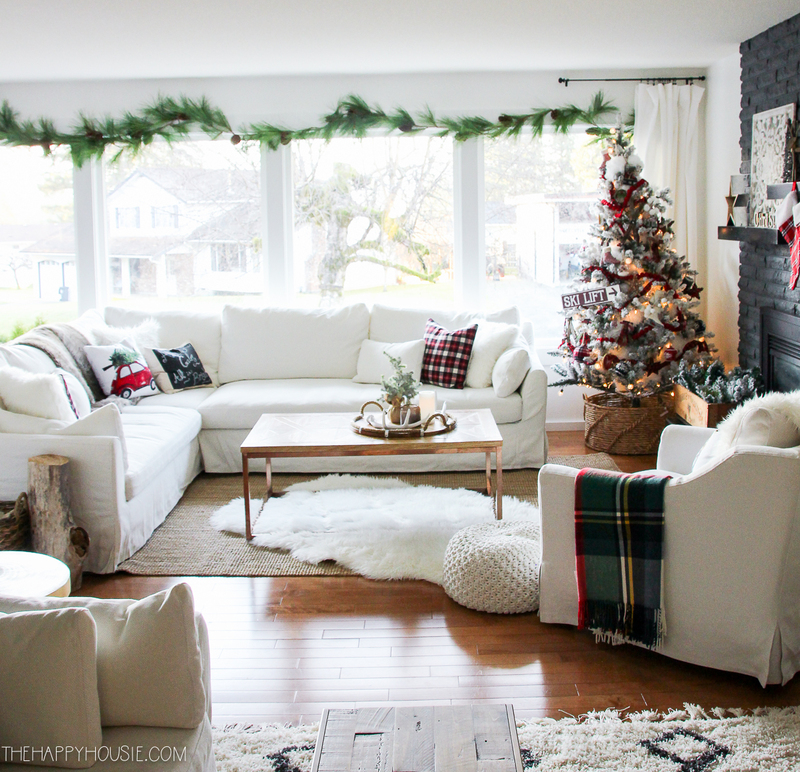 I love how everything turned out and I think that white slipcovers are a great choice! Perfect!